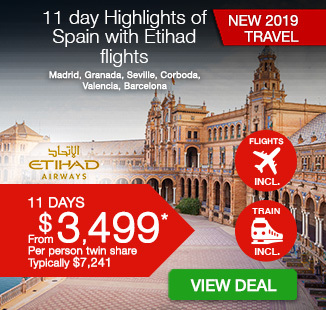 18 day Spain, Morocco and Portugal tour with Trafalgar, including return international Emirates flights, airport transfers, breakfast daily, escorted tour guide throughout, dedicated, air-conditioned transportation, in-depth sightseeing and more. Immerse yourself in the colour, culture and beauty of Europe and Africa with an 18 day Spain, Morocco and Portugal tour. Begin your trip in the fiery Spanish capital of Madrid where you will explore the vibrant streets, visit the iconic Puerta del Sol and admire the monument Cervantes at Plaza de España. Wander the imperial city of Toledo and discover the Church of Santo Tomé, home to one of El Greco’s most famous paintings. Venture through the town of Granada on your way to the gorgeous Costa del Sol, where you will cross to the North African town of Fez in Morocco. 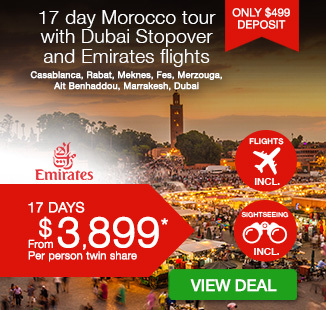 Roam through the fascinating Medina and the Royal Palace, before making your way to the vibrant city of Marrakesh and shop for bargains at the local souks and bazaars. Journey to enchanting Casablanca, a city of romance and intrigue made famous by Hollywood. Visit the capital city of Rabat, before crossing the Straits of Gibraltar to Seville, Spain. Admire the tiled fountains and pavilions in the Maria Luisa Park before commencing your panoramic journey through the province of Huelva on your way to Lisbon, Portugal. Visit the UNESCO-listed Hieronymite Monastery and the Belém Tower before continuing your tour through Fatima and then on to Salamanca. See the magnificent Plaza Mayor and the sun-kissed golden, orange and pink facades. Indulge in some last minute shopping on Gran Vía before heading home to Australia. Your package includes return flights, accommodation, English speaking tour guides, in-depth sightseeing and more. Depart Australia today to begin your journey of Spain, Morocco and Portugal. Colour outside the lines on this unforgettable encounter with the intoxicating lands of Spain, Portugal and Morocco, kicking off your unforgettable journey in the fiery Spanish capital of Madrid. Upon arrival at the airport, take a group transfer to your hotel (please refer to the Fine Print section of this page for important transfer details). March to the trill of the flamenco guitar, exploring the city’s vibrant streets before joining your fellow travellers and Travel Director for a Welcome Reception and orientation drive past some of the city’s most iconic sites. Join a Local Specialist on this day of discovery, including views of the iconic Cibeles fountain, the bustling Gran Vía, Paseo de la Castellana and Puerta del Sol, Madrid’s most famous square. At Plaza de España, we admire the monument to Cervantes and his beloved characters of Don Quixote before spending the rest of the day at leisure indulging in la buena vida. Consider an Optional Experience to the medieval UNESCO World Heritage city of Segovia or encounter the greatest collection of Spanish art in the world at El Prado. Optional Tour (additional cost applies): Segovia World Heritage Site – Its Ancient Aqueduct & Fairy-tale Castle. Enjoy a visit to Segovia, a UNESCO World Heritage Site which sits on a rocky outcrop between two rivers. With your Local Specialist, you’ll visit the 13th-century castle, reputed to have inspired Walt Disney, as well as seeing the best-preserved Roman aqueduct which has remained intact for 2,000 years. Witness the influence of Christians, Muslims and Jews that has spanned centuries in the imperial city of Toledo. Join your Local Specialist for a walking tour that will take you to visit the Church of Santo Tomé, home to one of El Greco’s most famous paintings – The Burial of the Count of Orgaz. Celebrate the tradition of steel manufacturing and moulding during a Cultural Insight at a local steel factory before meandering through the breathtaking Andalucian landscape to Granada where we’ll spend tonight. Tread in the footsteps of Spain’s last emirs and admire the incredible Alhambra Palace, a 14th century fortress that is said to have been inspired by poetry and reflects the description of paradise found in Islamic verse. Join a Local Specialist for a guided visit exploring its intricate designs, tranquil gardens and colossal walls. We leave the ornate palaces and fountains behind and continue to the famous Costa del Sol and sophisticated Marbella where we will spend tonight. Optional Tour (additional cost applies): Mijas Andalusian Hilltown & Mediterranean Dinner. Visit this charming hilltop village, perched high up with splendid views of the coastline. While here, you’ll experience its narrow streets with white-washed houses, unusual donkey taxi service, oval bullring, and shoppers will find some hidden gems. Your evening will finish with a Mediterranean dinner at a coastal restaurant. Optional Tour (additional cost applies): Jet-set Marbella: Puerto Banús & Mediterranean Dinner. Enjoy strolling through the atmospheric whitewashed townhouses & cobbled streets of Marbella´s old town. Following a drive along Marbella´s Golden Mile, we’ll explore jet-set Puerto Banús. Then, we’ll round the evening off with a delicious speciality Mediterranean dinner in a well-known local restaurant. We travel along the sun-kissed shores of the Mediterranean and cross to North Africa by ferry. A memorable drive past the Rif Mountains brings us to the Imperial city of Fez, with its ancient walled city – our home for the next two nights. Join a Local Specialist for a sightseeing tour through the cultural and spiritual centre of Morocco. Meander through the fascinating Medina of Fez, view its fortifications and Royal Palace, and admire traditional Moroccan handiwork during a visit to a carpet cooperative. Spend the rest of your afternoon at leisure visiting the madrasa, zaouia and palaces of this fascinating city, or consider a visit to the Imperial city of Meknes, with its medieval medina and harmonious Islamic and European styles. Optional Tour (additional cost applies): Arabian Dinner and Entertainment in a Riad. Enjoy a feast of fine food, live bands and traditional entertainment including belly dancing, in a spectacular Moroccan setting. Optional Tour (additional cost applies): Meknes Imperial City Visit & Exploration. We´ll drive to Morocco’s third Imperial city – World Heritage Meknes with its endless walls & ramparts, impressive Sultan Moulay Ismail’s 17th century granaries and stables that once housed over 12,000 horses. We’ll see the magnificent Bab el-Mansour Gate and visit a medieval school or “madrasa”. Departing Fez, we journey west through the green and golden landscape which turns to rusty red en route to the vibrant city of Marrakesh. Embrace the unrivalled energy of a city that is said to have been the favourite holiday haunt of Sir Winston Churchill. Relax after your journey or spend the evening enjoying an authentic Moroccan show. Optional Tour (additional cost applies): The Square at Night with Horse & Buggy and Traditional Dinner. You’ll take a horse and carriage ride to the magical Jemaa el Fna Square to enjoy the exotic sights and sounds of Marrakesh by night. Then we’ll have dinner in a typical Moroccan restaurant, with music and entertainment. Visit the Bahia Palace during your walking tour with a Local Specialist. See Djemaa el Fna Square in the old quarter with its palm-readers, acrobats and snake charmers. Visit a traditional Moroccan pharmacy for a Cultural Insight into the blending of creams and cosmetics from regional ingredients. The rest of the day is yours to explore. Don’t miss the chance to shop for bargains in the souks and bazaars or maybe visit a local Berber village. Dine tonight at your hotel. Optional Tour (additional cost applies): Ourika Valley And Berber Village Home Visit. You’ll enjoy a scenic drive into the Atlas Mountains where you’ll visit a typical home in a primitive Berber village in the Ourika Valley. You’ll also have the chance to bargain for beautiful, handcrafted jewellery made in the local style. We journey north to enchanting Casablanca to experience first-hand the intrigue and romance of this city immortalised by Hollywood. We meander along the city’s picturesque Corniche and enjoy views of the Hassan II Mosque with the world’s tallest minaret before venturing to the Moroccan capital, Rabat. Here we will view the Mausoleum of Mohammed V and 19th century Royal Palace, the residence of the Moroccan Royal Family. We arrive in Tangier later this evening where we will dine in our hotel. Crossing the Straits of Gibraltar by ferry, we arrive in Spain and journey through the region of Jerez, most famous for being the home of Spanish sherry. We drive through Andalucia and arrive in the beguiling city of Seville – our home for the next two nights. Where better to experience the passion of flamenco than this vibrant city? Embrace the intoxicating sights of colourful twirling skirts and the clapping sounds of castanets as you watch a traditional performance this evening. Optional Tour (additional cost applies): Discover The Origin Of “Tapas” & Evening In Old Seville. Join us for a dinner of mouth-watering tapas-style specialties. You’ll get the chance to taste different flavours and wines, before taking an atmospheric evening stroll through the charming old quarter of Seville. Optional Tour (additional cost applies): Flamenco: Experience the Best Show in Town. Discover the passion, rhythm and magic of an Andalusian flamenco show with us this evening. We’ve organised tickets to the best show in town, where you’ll experience 90 minutes of memorable entertainment with an included drink. Optional Tour (additional cost applies): Flamenco, the best show in town with a three-course dinner. After a three-course dinner of Andalusian specialties with drinks included, you’ll discover the passion, rhythm and magic of flamenco this evening. We’ve organised tickets to the best show in town, where you’ll experience 90 minutes of memorable entertainment. Join a Local Specialist for a sightseeing tour that will take you past the iconic Giralda Tower. Admire the tiled fountains and pavilions in the Maria Luisa Park, the showcase for the Ibero-American Exhibition in 1929, and visit the imposing Plaza de España. See Christopher Columbus’ ornate tomb in the Cathedral, the largest Gothic Cathedral in the world, and enjoy a walk through the lovely historic Jewish Quarter. Optional Tour (additional cost applies): The Moorish Alcazar And Plaza América. We’ll begin with a visit to the elegant 14th-century Moorish Alcazar, set in its own beautiful gardens. The gardens were recently used as the setting for the Water Gardens of Dorne in the Game Of Thrones series. Then, we’ll journey to the famous exhibition site of Plaza América – a must for any visitor to Seville. Your panoramic journey continues through the province of Huelva, famous for Jabugo jamon and the Rio Tinto mines. We cross into the golden fields of the Alentejo region, the gastronomic soul of Portugal. Enjoy a memorable Be My Guest lunch at a local stud farm where Lusitano horses have been reared since the 18th century before arriving in Lisbon this afternoon. Optional Tour (additional cost applies): Gourmet Dinner, Parliament, Exclusive Estrela and Evening Orientation. Your opportunity to enjoy the exclusive district of Estrela, its park, basilica and the Portuguese Parliament, on the way to a delicious gourmet dinner. You’ll finish the evening with a drive along the banks of the mighty River Tagus. Optional Tour (additional cost applies): Seafood Dinner By The Tagus River. Take a ferry across the mighty Tagus River and enjoy typical Portuguese seafood and fish specialities at a local restaurant. After dinner, we’ll cross the impressive Suspension Bridge for a sweeping view over the Portuguese capital. Explore the centuries-old seafaring heritage of the Portuguese, paying tribute to the great explorers who bravely set off from Portugal’s shores to discover the new world. See the gleaming Monument to the Discoveries, the suspension bridge spanning the River Tagus, Belém Tower and the quaint Alfama district, home to the melancholic fado. Join a Local Specialist for a sightseeing tour of the UNESCO-listed Hieronymite Monastery before spending free time exploring the city’s quaint bairros or perhaps consider an Optional Experience to discover Portugal’s Golden Triangle of Queluz, Cascais and Estoril. Optional Tour (additional cost applies): Portuguese Fado Evening Of Music & Song With Dinner. An evening’s entertainment Portuguese style. You’ll savour a typical meal with local aperitifs and wines and hear beautiful, traditional Fado singing. Optional Tour (additional cost applies): The Golden Triangle: Sintra, Cascais & The Estoril Coast. After passing through the fashionable resort of Estoril, we’ll explore the picturesque fishing village of Cascais, with its beautiful array of mansions and exclusive residences. To complete the Golden Triangle we’ll visit the impressive Royal Palace of Sintra. On occasions where Sintra is not available you will be offered a visit of the Palace of Queluz. We trace the path of pilgrims who for decades have ventured north to the celebrated shrine at Fátima to pray to the Virgin Mary and see the site of celebrated religious miracles. Departing Portugal, we arrive in the historic university city of Salamanca – La Dorada, so named for its sun-kissed golden, orange and pink façades which we will have an opportunity to see the magnificent Plaza Mayor – voted by the locals as the most beautiful of all squares in Spain. Traversing the dramatic Sierra de Guadarrama Mountains we arrive in Madrid, Europe’s highest capital city. Spend this afternoon exploring the sights. Indulge in some last-minute shopping on Gran Vía or relax in one of the plazas and people watch. This evening we join our travel companions and Travel Director for a memorable Farewell Dinner with wine. Optional Tour (additional cost applies): Discover “El Escorial” Palace/Monastery & The ‘Valley Of The Fallen’. Come with us, along with a Local Specialist, to the royal city of El Escorial, where the great monastery palace was built in the foothills of the Guadarrama Mountains. We’ll also visit the incredible Spanish Civil War memorial , which is cut into the rock face. Our epic journey through Spain, Morocco and Portugal comes to an end this morning. Group transfers to the airport are available for your homeward flight. Pending flight departure times, you may wish to make your own way to the airport and spend a few more hours exploring the city (please refer to the Fine Print section of this page for important transfer details). Must book by the 65 days prior to departure. Final payment is due on 31 January 2019 in order to take advantage of the Early Bird discount included in the package price! Excludes: Travel insurance, Visas, Personal expenses, Anything not mentioned or “optional” or “own account” in the itinerary. Please note that on some occasions there may not be any suitable flights that link up with the arrival transfers specified above. In such instances, you should make your own way to the hotel. Pending flight arrangements with the advertised promotional airline, you may need to wait several hours at the airport prior to your departure flight. Alternatively, you are welcome to make your own way to the airport at a time of your choosing (additional expense). Please note that optional excursions can only be purchased while on-tour. Including 30kg checked baggage per passenger (actual limit is subject to change according to airline policy).